The history of early modern drama and theatre is punctured with gaps, unknowns, and absences. Over half of the estimated 3,000 professional plays performed before the closure of the theatres in 1642 have evaporated without a trace. About 750 plays endure as only fragments, such as a play title or extract, that point to complete scripts otherwise lost; the number of these lost plays and our knowledge of them continues to grow, thanks to the ongoing work of The Lost Plays Database, edited by Roslyn Knutson, David McInnis and Matthew Steggle, and hosted by the Folger. Even for the 543 plays for which a complete playscript survives, many unknowns remain: for most plays, we simply don’t know the exact details of who performed these plays, when, where, with what materials, who saw the plays and what they thought of them. Some of the best-known absences of early modern drama relate to Shakespeare: the lost plays Cardenio and Love’s Labour’s Won, and Shakespeare’s missing authorial manuscripts have led generations of scholars on quests that so far have turned up mostly empty. Such gaps can be frustrating for the modern scholar, but they also provide opportunities for creative reconstruction of the absent object, critical imagination, editorial maneuver and material discovery. Another gap exists in the center of seventeenth-century dramatic scholarship: the era of the English Civil War and Interregnum (1642-1660), when commercial playing was outlawed. Modern criticism often treats this period as an empty space between the dramatic traditions of the Renaissance and Restoration. But English drama did not disappear during the Civil War and Interregnum. Nor did the prohibition cause people to simply forget about the professional theatrical tradition of the late-sixteenth and early-seventeenth centuries. Far from being a dramatic dead zone, this period spurred new and different ways of producing, consuming, and thinking about plays, on the page, on the stage, and in the cultural imagination. At the Folger, I’m writing a book titled Play without a Stage: English Renaissance Drama, 1642-1660. It argues that the suppression of the theatres between 1642 and 1660 prompted responses that lastingly colored how we think of professional drama in the English Renaissance. The era of the theatre ban determined the boundaries of the period, the contents of the corpus, and the value ascribed to plays. If loss is an enabling condition of scholarship, then 1642 represents the moment when early modern plays as a group started to recede from the contemporary into the historical. In other words, we have the theatre ban to thank for losing plays, creating gaps, and giving us something to do. The Folger’s extensive collections of professional playbooks, dramatic paratexts, manuscripts, commentary, and compendia from the 1640s and 1650s are key resources for my project. These texts register how contemporary political and cultural turmoil transformed ideas about drama. Dramatic materials from the 1640s and 1650s reveal a newly acute sense of English’s drama’s vulnerability (a tradition previously taken for granted), and a preoccupation with staving off further dramatic loss through print publication. As mid-seventeenth century stationers attempted to salvage England’s endangered dramatic heritage, they filled many gaps of early modern drama; they also created new gaps, and opportunities for scholarship. 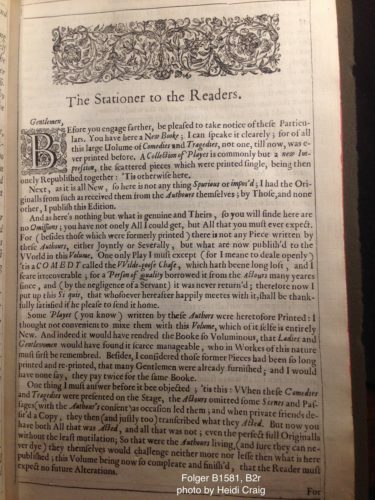 During a recent session of Material Witness, I had the opportunity to select and display some of the Folger’s rare playbooks and dramatic manuscripts from the 1640s and 1650s, and to lead a discussion about the material gaps of early modern drama, relating them to the scholarly gaps that we seek to find and fill; this Collation post developed out of that session. 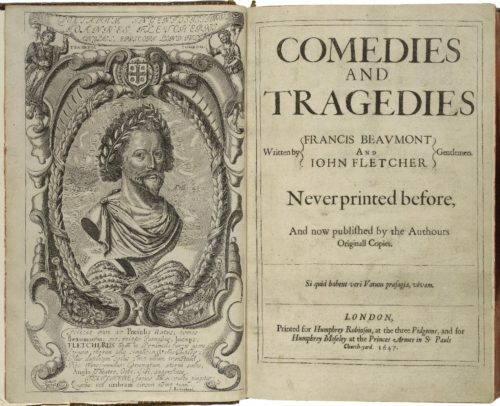 Frontispiece and title page of Comedies and Tragedies, the collected works of Francis Beaumont and John Fletcher, printed in folio by Humphrey Moseley (with Humphrey Robinson) in 1647. Folger B1581. Image from LUNA. Beaumont and Fletcher’s collected works in folio, printed in 1647 by Humphrey Moseley (with Humphrey Robinson), is perhaps the most important dramatic publication of the period. The folio commemorates not only the late dramatists Francis Beaumont (d. 1616) and John Fletcher (d. 1625), but also the entire tradition of English professional theatre, which (setting illegal performances aside) had effectively ended five years before. In this moment of theatrical dearth, Moseley offers dramatic abundance: this handsome folio edition features thirty-five previously unprinted dramatic texts (thirty-four plays and a masque). That Moseley could obtain so many unprinted playscripts by popular dramatists is indicative of the wider publication trends in the 1640s and especially the 1650s. With the theatres closed, struggling playing companies sold off the dramatic manuscripts they could no longer perform to mid-century stationers, who set to publishing many (but not all) of them. Extract from Moseley’s “The Stationer to the Readers,” in Beaumont and Fletcher, Comedies and Tragedies (transcribed below). Folger B1581, B2v. Photo by Heidi Craig. Moseley’s comments suggest that, in the 1640s, dramatic manuscripts circulated pervasively—at least among the “Gentlemen” who could afford them. The Folger possesses splendid dramatic manuscripts of two Beaumont and Fletcher plays, The Woman’s Prize or The Tamer Tamed, and The Beggar’s Bush. Both manuscripts date to around 1640. 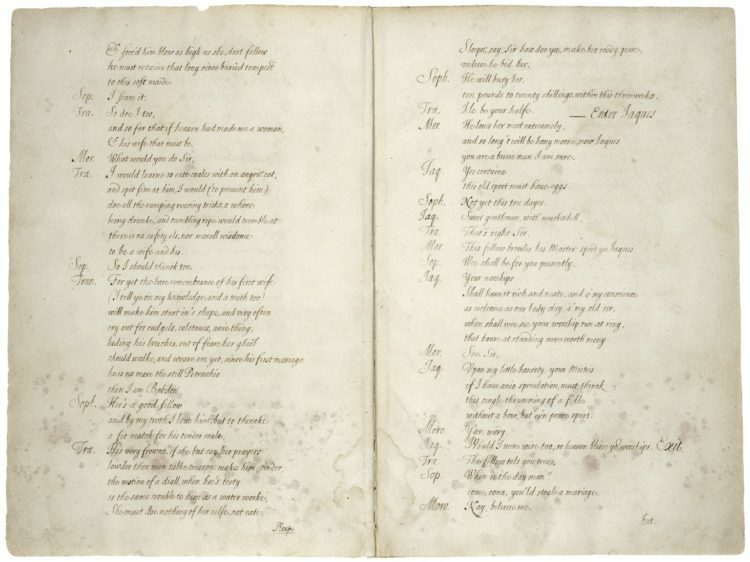 Dramatic manuscript of Fletcher, The Woman’s Prize (ca. 1640), f. 71v-72. Folger MS J.b.3. Image from LUNA. Dramatic manuscript of Beaumont and Fletcher, The Beggar’s Bush (ca. 1640), fol. 1v-fol. 2r. Folger MS J.b 5. Image from LUNA. 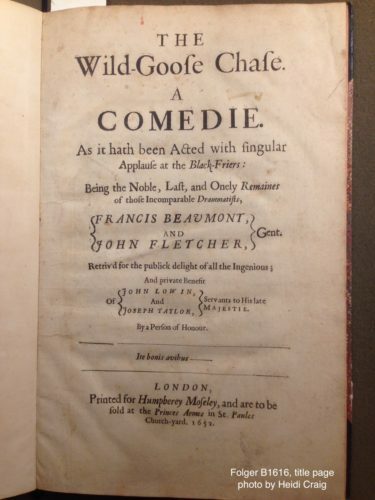 These plays were first performed in the 1610s, but first printed in the 1647 folio. If you wanted to read these plays before then, you’d have to get your hands on a manuscript. The two Folger manuscripts are in the beautiful handwriting of a professional scribe, which suggests they were produced for a wealthy reader. These materials also lend credence to Moseley’s claim that a single manuscript cost over four times as much as his entire folio in print. In 1925, Henry Folger purchased these two manuscripts as part of a larger collection (known as the Lambarde collection) of manuscript plays. The collection of manuscript plays was later pulled apart in a moment when there was a premium on individual titles; an important reminder of the different “public troubles” that materials might be vulnerable to at different periods of their existence. Extract from Moseley’s “The Stationer to the Readers” in Beaumont and Fletcher, Comedies and Tragedies (1647) (transcribed below). 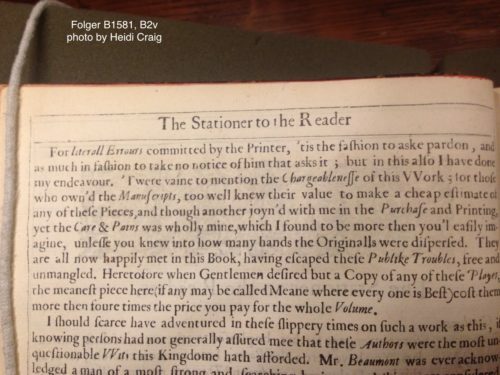 Folger B1581, B2r. Photo by Heidi Craig. Moseley leaves a tantalizing gap in the middle of Beaumont and Fletcher’s corpus: “one only” missing play keeps the reader from the complete works of Beaumont and Fletcher. This gap must have been frustrating to some, but once again, a gap of this kind offers opportunities. Readers can imaginatively reconstruct the absent play; they can also search for the missing manuscript (hopefully without interrogating any “negligent” servant, on whom Moseley rather conveniently pins the loss). In short, Moseley invites his mid-seventeenth century readers to undertake work similar to that of the modern scholar: they can attempt to recover the material absences of early modern drama; in the meantime, they can supplement those gaps with creative flights of fancy. Of course, the gap Moseley creates is also a business opportunity: should the manuscript of The Wild Goose Chase reappear, Moseley can publish it, and squeeze one more purchase out of completionist readers of Beaumont and Fletcher. Title page of Fletcher, The Wild Goose Chase, printed by Humphrey Moseley in 1652. Folger B1616. Photo by Heidi Craig. Most scholars take Moseley’s narrative about the loss and recovery of the manuscript at face value. Although we can never confirm or deny the veracity of Moseley’s story, bringing particular materials together during the Material Witness session allowed us to think about his story in a new way. 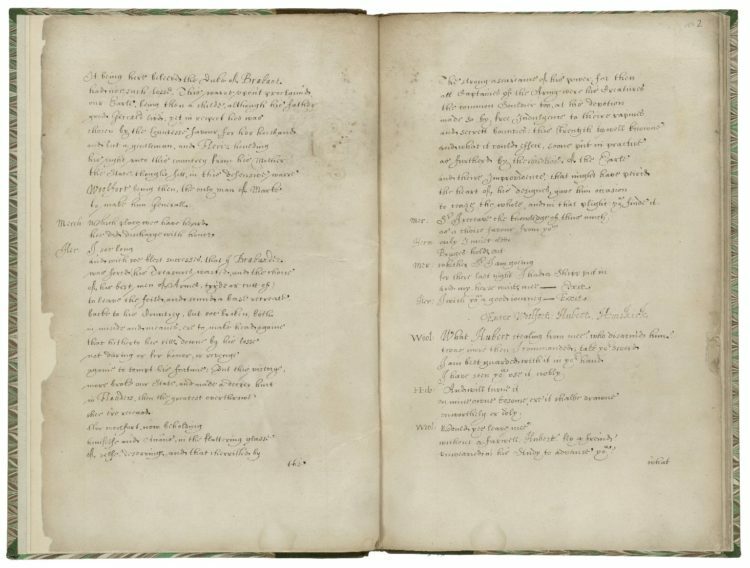 Seeing the Folger’s copies of the Beaumont and Fletcher folio collection and The Wild Goose Chase side by side underscored the anxiety about dramatic loss, and the appeal of recovery, that pervaded the period. In the 1647 folio, Moseley laments the loss of The Wild Goose Chase, arousing readers’ desire for its recovery; in 1652, Moseley printed The Wild Goose Chase in folio, a relatively rare choice for a single-text professional play but one which allowed readers to bind the play to the larger collection, happily reuniting the orphaned play with its fellows. Though English theatre was in decline, print publication was a bulwark against further dramatic loss. 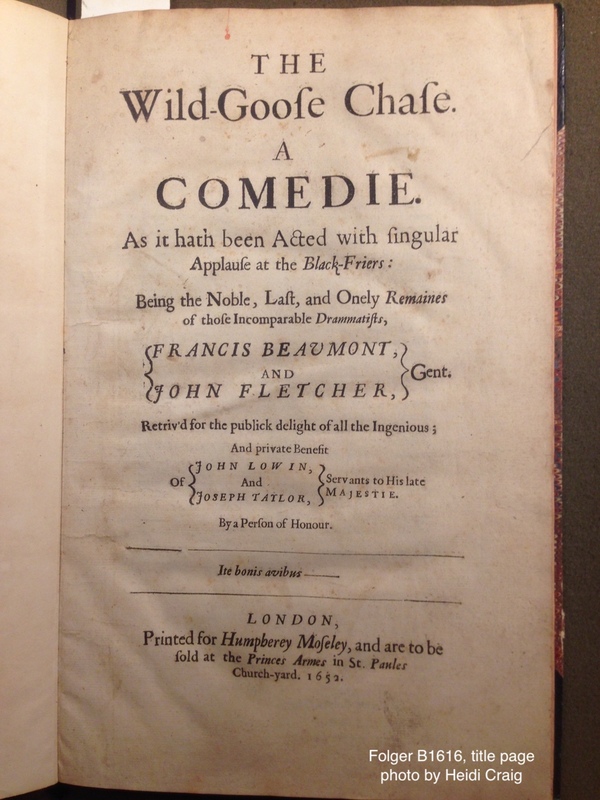 Without Moseley’s editions of the Beaumont and Fletcher folio and The Wild Goose Chase, thirty-six plays of Beaumont and Fletcher might have been counted among the lost plays of early modern drama. Moseley was a prolific, but perhaps overly ambitious stationer, however: in the 1640s and 1650s, he entered dozens of titles into the Stationers’ Register (the record book of the Stationers’ Company which documented a publisher’s right to produce a particular printed work), most of which he never actually printed. It is primarily from Moseley’s efforts to fill the gaps of early modern drama that know about Shakespeare’s famous lost play, Cardenio (the King’s Servants performed a play called Cardenna or Cardenno in 1613, but it is Moseley who attributes it to Shakespeare and Fletcher). 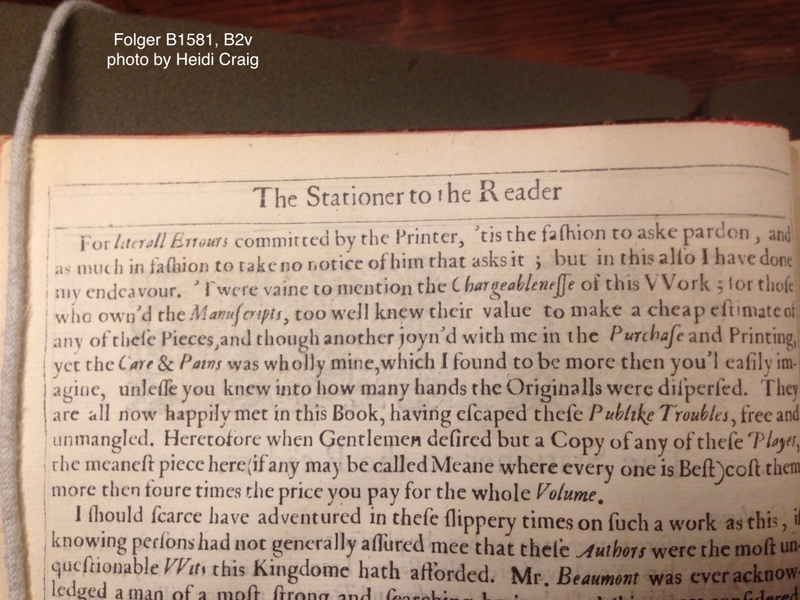 In 1653, Moseley entered Cardenio into the Stationers’ Register, but he never printed it. At some point, due to “troubles” (public or private) the manuscript was lost. Cardenio has been called “the holy grail” of Shakespeare Studies; since the eighteenth century, the play has been imaginatively reconstructed by writers and scholars; and has sparked never-ending quests in archives and attics for the missing manuscript. One might say that Moseley’s Stationers’ Register entry has led scholars on a wild goose chase for the missing manuscript of Shakespeare. Perhaps one day the text of Cardenio will be “Retriv’d for the publick delight of all the Ingenious.” Until then, we happily have the latitude to fill this and other material gaps of early modern drama with our scholarly imaginations. Heidi Craig is a Folger-Mellon Long-term Fellow at the Folger Shakespeare Library for 2018-19. She completed her PhD in English at the University of Toronto in 2017. At the Folger, she is completing a book manuscript entitled A Play without a Stage: English Renaissance Drama, 1642-1660, which examines the production and reception of early modern drama during the English Civil War and Interregnum, when commercial playing was outlawed. It’s important to remember that the actors only received copies of their own lines plus cues, a practise that was still in use for shows like pantomimes into the twentieth century. That’s why the roles are called “parts”. And that’s what Peter Quince is handing out to the mechanicals in “A Midsummer Night’s Dream”. He himself has the only full copy. So for the publisher to acquire a full script might indeed mean dealing with many people – actors, families, stage manager if you were lucky. There’s an anecdote that ar least one of Shakespeare’s plays was readied for publication by the actors getting together and running through the play by memory while somebody wrote it down – probably with a lot of “no, no, you’re wrong, it’s ‘stones and arrows’ not ‘slings’ ” going on at the same time.